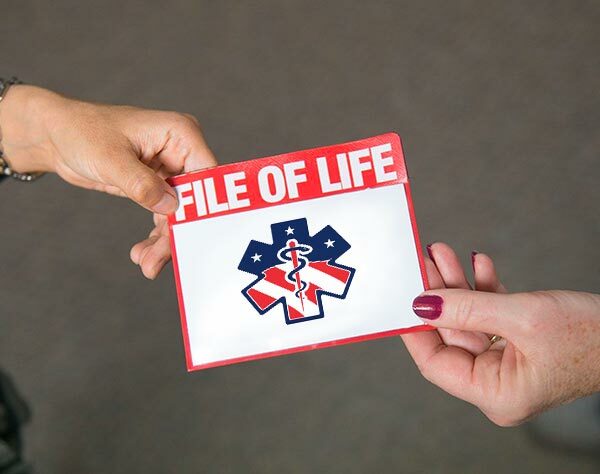 The File of Life is an emergency preparedness file that promotes safety and peace of mind. It is the first thing that emergency personnel looks for when they enter your home. File of Life provides important information about your medical history, physician info, and medications all in one place, in case of emergency. The File of Life is a refrigerator magnet with an attached red plastic pocket labeled “FILE OF LIFE”. In the plastic pocket is a tri-fold card on which you can record your vital emergency information. Fill in the information on the card. Remember, the information will help first responders to better assist you in an emergency. When you finish filling out the card, fold it and place it back into the “FILE OF LIFE” plastic pocket and then place the whole thing on the outside of your refrigerator. Simple as that! Don’t forget to keep your FILE OF LIFE information up to date! Use the form below to request your File of Life today.